This month, author Hugh Howey posted another Author Earnings report and the data is really interesting. Howey started this project to identify emerging trends in digital publishing and therefore help writers make more informed choices about publishing their manuscripts. To acquire the data, he looked at four things on Amazon: number of ranked titles, number of unit sales, gross earnings, and author earnings. He also has a link describing his methodology and, although I haven’t read that link, his stats are intriguing. Of course, there are always skeptics and critics, which is good. Questions should always be asked. I won’t go into all the numbers and stats Howey came up with as you can read the report and see the graphs yourself, however a couple of things did strike me. The numbers show that self-publishers (also known as indie publishers) and small-to-mid-sized publishers are outselling the big five publishers on the bestseller list. They are also doing better in daily unit sales, (a combined 51% of sales to the big five’s 38%,) however, the big five publishers are making more money. Book pricing appears the big difference here, although there could well be other factors. Howey also notes that self-published authors have been steadily earning more income (although disgruntled indie writers on Kindleboard forums would dispute this) while big five authors are earning less. Howey states that indie authors now earn more royalties than all big five authors combined. Based on his last two reports, indie author royalties are definitely creeping up the ladder. In fact, self-published authors are earning 40% of all royalties paid on the Kindle store. One possible reason for this, Howey says, is that big five publishers do seasonal promotion rather than year-round events like indie publishers tend to do. Good novels, they say, aren't written, they're rewritten. Some writers do all their revisions in their heads before they begin, or subconsciously as they write. Their rough draft is their final draft. Those writers exist, but they're few and far between. Most of us have some clean©up work to do after we've typed "THE END." Two tools you'll find helpful in revising manuscripts are: a notebook and a shelf. I keep paper handy to make notes about changes I need to go back and make; I'll think of a motive I haven't explained or a question I haven't answered – or that a character hasn't asked, although he should have. In SAGE, I found that I needed a handy way to indicate family affiliation, since I identified people by their mothers' given names rather than by their fathers' last names. So I made a note of that and, when I went back to the book after a summer vacation, I went through and plugged in the change. I would normally do that after I had finished the entire book, but I would normally finish the entire book during one school year, and SAGE ended up taking nearly twenty. As for the shelf: It's a good idea to let a book "settle" for a while, so you can go back and read it objectively. Be your own critic. Do any rewriting you think necessary after this cold reading and analysis. Then get out your notebook again. After I've "finished" a book, I pass it around to several people whose opinions I value, along with a notebook, and ask them to make comments. I compare their comments; if several of them have a problem with the same thing, I figure I probably ought to change that. If different ones have different negative comments, I change the ones I agree with. When your book is as good as you can make it this time, start sending it out. The four Divine Animals are afoot: Dragon, Unicorn, Phoenix, and Tortoise – the Divine Creature who "forgets" the rules of right and wrong. Hold on tight. Karol, the hereditary ruler of Layounna, vanished while hidden away with her lover, leaving her consort-husband to claim the throne. Shortly afterward, all the children in Layounna's orphanages also vanished. 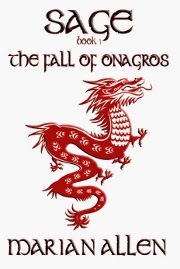 Ten years later, Karol's consort-husband claims an obscure young woman as a second wife, and she also vanishes. The consort's mother and sister dabble in dark matters, including blood sacrifice and poison. Opposed to them are the country's "unimportant" folk, including a silversmith, a disgraced adept, a shapechanging thief, a couple of kitchen maids, and at least one cat. SAGE, one book in three volumes. I’m very excited about this book. The setting and theme of youths at risk came from my volunteer work in a youth detention center way back when I was a criminology student. I never forgot some of the residents or my experiences there, and while Casey’s experiences are much more dramatic, the setting reflects the emotional, hostile environment that detention centers can be for teens in trouble with the law. Transit security officer Casey Holland’s latest assignment—to monitor a group of teens riding the M5 bus after shoplifting sprees—spirals out of control when the kids attack her and her colleagues. Compounding Casey’s stress, is the manipulative boy her thirteen-year-old ward, Summer, is dating, and intense volunteer work at Fraserview Youth Custody Center. Casey’s shocked to find a friend’s grandson, Justin, inside. Shock turns to horror when the facility’s director suffers a fatal heart attack in front of her. A second death and rumors of illegal activity at Fraserview makes Casey wonder if Justin is part of the problem, or a potential victim. As Casey deals with troubled teens on all fronts, the escalating violence could change her and Summer’s lives forever. Who will live and who will die? 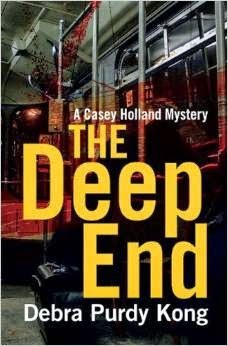 Debra Purdy Kong’s fourth installment in this series will keep readers guessing right to the end. The only true thing about publishing these days is that nothing ever stays the same. I’m not sure that it should. Some changes are for the better, but based on a study by the Authors’ Licensing & Collection Society (ALCS), income for U.K. writers has dropped significantly over recent years. 2,454 authors took part in the study, 56% men, and 44% women. By the way, 17% of respondents were age 44 or under, 54% were 45 to 64, and 29% were over 65. Whether age has any bearings on findings, I don’t know. Based on the three articles I’ve read about the study, it seems that a significant portion of the writers who took part were writing literary or mainstream novels, however science fiction and children’s writers were also quoted. The study showed that many full-time, professional writers are earning less money than they were eight years ago. For the study’s purpose, a professional writer is someone who spends the majority of their time writing and whose primary income comes from writing. The typical income was about £11,000, yet in 2005 it was £12,330; a significant drop if you’re depending on every penny to feed and house yourself. One development and research foundation states that an individual needs about £16,850 to maintain a socially acceptable standard of living in the U.K.
It’s no surprise, therefore, that the study also showed that the majority of writers who made their living from writing dropped about 40% from 2005 to only 11.5% .in 2013. In others words, many more writers are supplementing their incomes through other means. There are many more comments and stats which you can read about through the links below. Discussion also refers to the 25% of self-published respondents. Hugh Howey’s name and his AuthorsEarnings report was also mentioned in one of the pieces. What was missing for me was detailed discussion about why this was happening. Certainly, there were references to the worsening contracts for writers, and how the literary novel is apparently dying. But any detailed analysis about changes in buying and reading habits was lacking. What do book buyers have to say about all this? Incidentally, the ALCS, will release a more detailed report in the fall and hopefully that will generate more discussion as to why incomes have declined so much. You know, In the 30+ plus years I’ve been writing and reading about these issues, a writer’s income has always been significantly lower than the national average. That they are dropping even lower at a time when publishing options have never been better for writers is perplexing on one hand, but not so much on the other. Given the many articles, blogs, and forums discussing the rise in income for a growing number of independent authors, lots of us believe that there’s hope for the future. But the highest money earners these days seem to be writing romance, erotica, and fantasy. Will that change? Is the reason for dropped incomes really as simple as genre writers increasingly outselling their literary counterparts? On the other hand, there are more books being released than ever, more competition than ever, and more free books being given away than ever. It’s a complicated issue. Anyway, read the articles. I’d like to hear your take on all this. How Many Canadian Books Have You Read? Last Sunday afternoon, my husband and I were listening to CBC Radio while driving home from an excursion. The topic was the top 100 books that make you proud to be a Canadian. The program’s guest was one of the people who comprised that list. She made it clear that the list was completely subjective and that there were many other great books out there. I don’t remember all of their criteria for the picks but I do recall that emotional impact was one of them, and I think commercial success also played a role. They also chose books that reflect decades of Canadian writing and not just recent work by Canadian authors (at least I think they all are), and/or with Canadian settings and focus. I have read eight on the list. One or two more I kind of remember reading forty years ago, and there were at least ten more authors whose other novels or short stories I’ve read. I was happy to see that the list wasn’t exclusively literary. Louise Penny’s Still Life made the list, and yes, it’s a memorable mystery. William Gibson was also on the list, and many other familiar names I still intend to read. The top 100 can be found on the CBC’s website, which I’ve linked for you. Happy reading! 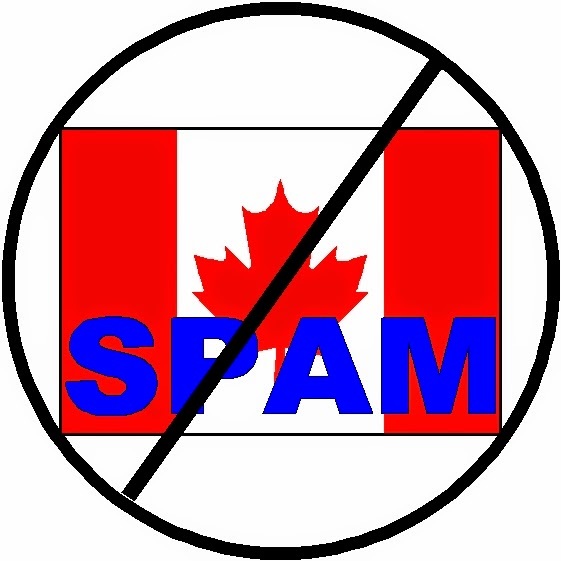 On July 1, 2014, a new anti-spam legislation came into effect in Canada, and it's considered to be the toughest anti-spam law in the world. And it will affect how some Canadian authors do business--it may even affect their income.